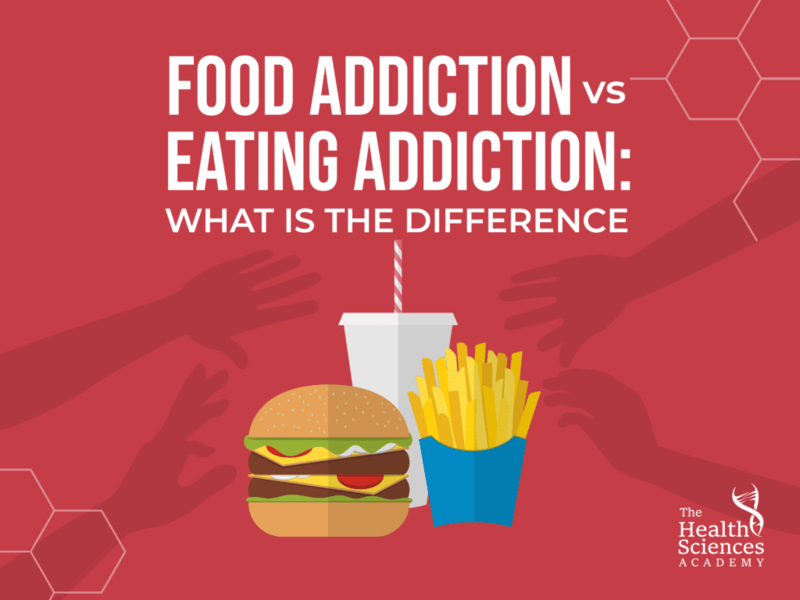 Food Addiction vs Eating Addiction: What Is The Difference? Anything that gives you pleasure and provides a reward to your brain has the potential of becoming addictive. Some things can be more addictive than others, making them harder for you to resist. Hyper-palatable sugary, fatty or salty foods are at the top of the list. Think about it, no matter how hard some people try repeatedly, they just cannot control themselves around them. As a matter of fact, scientists Daniel Blumenthal and Mark Gold found many similarities between the consumption of certain foods and ‘substance addiction’. They called it ‘food addiction’. But another group of 12 scientists took a step further. They asked themselves: What if it’s not just the particular food (the substance) that we’re addicted to? Could it be that we are addicted to something else that makes us eat it? Today, I’d like to share with you some very powerful information around another type of addiction – it’s called ‘eating addiction’. And no, it should not be confused with ‘food addiction’. You’ll learn the similarities, the differences, and how current evidence suggests that the term ‘eating addiction’ better defines non-substance related behavioural addiction. How are food addiction and eating addiction related? Scientists now make a distinction between two types of addiction that can lead to overeating: ‘food addiction’ and ‘eating addiction’. One doesn’t necessarily exclude the other. Both of these addictions have negative consequences that challenge scads of people. Given the rising levels of obesity, both types contribute to the debate over what propels people to overeat. In terms of symptoms and where in the brain addiction occurs, having a ‘food addiction’ has been connected in the very same way we would speak about the addiction to drugs. And much of the blame is being placed on the food industry for the production of highly-addictive inexpensive foods to boost sales. But ‘eating addiction’ has its own set of particulars. It brings the attention back to the individual – and not the external substance (the food or ingredient). This is where we will shift the focus of this piece – how ‘eating addiction’ differs from ‘food addiction’ in terms of what happens in the process of eating and the ‘reward’ associated with it. What are the characteristics of an eating addiction? Published in Neuroscience & Biobehavioral Reviews, the same 12 scientists tell us that the focus on confronting the obesity problem should be moved away from the food itself (the addictive substance) towards the person’s act of eating (the addictive behaviour). Eating addiction is a behavioural issue and has now been categorised alongside conditions like gambling addiction, especially when the psychological compulsion to eat is driven by the positive feelings that the brain associates with the very act of eating. ‘Eating addiction’ stresses the behavioural component, whereas ‘food addiction’ appears more like a passive process which simply befalls an individual. Let’s take a step back and think of a smoker. A smoker not only battles the substance dependance but also the related behaviours: it’s not just the nicotine that smokers miss when they give up smoking, but also the holding of the cigarette, the puff, feeling the texture, and the multiple sensations surrounding the experience. Many behaviours can be termed ‘addictive’ without the involvement of any external substance. Take for instance mobile texting and e-mail. There’s something irresistible about an unopened message – and some of us may feel uncomfortable or even anxious unless we open it. It’s not about what’s inside the message. It’s the very act of clicking to open it that the brain can’t resist. All of this happens even before you swallow the bite! These pleasurable acts can be so addictive. While the term ‘eating addiction’ is still in early stages, it certainly has the potential to impact public health regarding its prevention and treatment. One could begin by asking if the cause of overeating and obesity is rooted in addictive behaviours. This might be well worth a public debate as well as the consideration around using the term ‘eating addiction’. Do you think prevention and treatment should focus on the addictive nature of certain foods or on people’s eating behaviours? Or both? Do you have any personal or client experiences that you can relate to and share here? Please jump into the conversation in the comments below. Pass this onto someone you think could benefit from learning the difference between ‘food addiction’ and ‘eating addiction’. Couldn’t you argue an eating addiction is an element of an eating disorder? I have a stress eating disorder. It used to be my one and only source of ‘fully’ releasing my stress- nothing else could satiate that feeling. But I guess thats because when I say ‘fully’ I literally mean food as a mechanism to over indulge, fast. Only until I felt bloated and heavy, I could cloud my stressful emotions and let the physicality of having a food baby kick in. But I argue its a combination between a food addiction and an eating addiction. It starts off as a eating addiction – my behavioural patterns related to stress relief and the relieving feeling from picking my food- playing with it, chewing it slowly, peeling it, brushing the salt off my nuts. My food addiction then grows as I over satiate and binge – I feel a need for a greater physical reward because I am still left emotionally unsatisfied by my addiction. I reach for sugary and fatty foods, knowing well the consequences but I am irrational and panicky, seeing it as the only saddening way to satiate myself. Next morning guilt. So yes please research more on eating addictions – or invest more on stress relief..I think smokers and eaters and anyone with an unhealthy habit have that in common..the need for physical gratification to hide from our emotions. Gabrielle, thanks for sharing! Scientists gave it a name: ‘stress eating’, when we use food as self-medication, to soothe you. And it can happen to anyone, it’s not limited to those with an addiction. After reading this news letter and thinking about the way some people eat and act i’d have to say that “Both addictions/behaviours’ should be treated. Sarah, well done for observing this on others too! I agree! I don’t want coffee until I smell it brewing. I always say, “No thank you” when offered toast, but once I smell it cooking… different story. Also, smells trigger visceral reactions and tap into memories and emotions both good and bad, maybe even without being cognitively aware of it. I am not sure that separating food addiction and eating addiction is valid. They are surely parts of the same addiction where as much pleasure comes from the hunt for food as the consumption of it. I believe that the effect of boredom needs to be taken into account. From my own experience, ‘Oh I’m bored, what is there to eat’ is a common cause of over eating. Indeed, Colin, this is just the tip of the iceberg! Being addicted to eating surely is nothing new. I have been addicted to the act of consuming for many years (scads in fact…), it is most definitely behavioural, but also has reward from the sensation of feeling full. There will always be favourite food items, and no doubt the sugary/fatty ones that trigger hormone release, but the act of eating is also “something to do”, so perhaps needs to to be tackled together with getting people active – not just for physical health benefits but to distract and place less emphasis on food. Active could mean reading, but a past time that doesn’t involve eating. That’s my view anyway! I notice that when I’m physically active (outside of my home), I don’t crave anything, so I completely agree with this recommendation on a personal basis. The article struck a note with me though, and that is dealing with the personal issues around the act of eating. For me, as a kid I grew up in a rural town with kids I was not compatible with. My release was snacks and reading (mostly together). Fast forward to today and my life is much happier and I enjoy success, etc. but I still have that childhood-born addiction to eating and reading. I would be interested to know more about this issue from a personal history point of view. Very interesting and thought-provoking article, thanks! I feel exactly the same way, it is like when I’m following a plan for working out regularly, I don’t want to eat anything unhealthy or overeat. It is during those down times that I crave yummy food and drink. Hi everybody! i have put my body through sone tough times with food addictions. I rarely eat and when i do, i eat the same thing day in, day out for months/years until i fancy the looking of something else and once ive tried the new ‘yogurt or piece of fruit for example, im then hooked on it and will only eat that chosen food for that particular period. Sometimes i choose an unhealthy option but compensate by knowing that my food choice will change again, at some point to maybe something health. My problem is when i have no appetite and can go 3-5 days without eating anything until by brain decided on my next food fad. I solely ate black cherry yogurts and bananas for about 2 years bofore switching tl creme eggs (upto 25 a day at my worst. . I know im damaging my health and have i high risk of certain cancers due to my food fads but its been going on for 30 years and havent found a solution to change my habits. Im always lethagic, extreme fatigue,moody, with drab hair, dull spotty skin. Even though i barely eat, im 5’4″ at 10.5 stone and have no idea why 8 would be a size 6 on the calories i consume. Does anyone else have this problem? Sarah, you don’t have food addiction, just primal and essential need for food. When you go several days without food, you are starving your body, and your brain is so desperate, it wants you to consume sugar, after all, that’s the only thing it can use. You need help dealing with this compulsive behavior. You realize the damage you are doing, dress size has nothing to do with it. Healthy isn’t tiny, it’s glowing, strong, energetic. Please take better care of yourself, and seek the help you need. I think the study needs to focus on both issues since both issues likely have affect on the individual with one of these addictions. Just like the example of cigarettes the nicotine in the cigarette is what the person is addicted to but it is now also the habit of having the cigarette in hand etc that the person is also “addicted” too. Lana, it’s very interesting what you’ve just said, one can be a trigger for the other. Great point! I agree completely. I’m a case in point. I’m always grabbing for something to stick in my mouth while at work in the morning. It isn’t because I’m hungry, or even that whatever I’m eating is that appealing, in and of itself. It’s the ACT of eating, and I don’t really know why. It only lasts for the morning. Once half the day is over, and “all the rest is downhill from here” – a good feeling that may replace the good feeling of eating in the morning – I’m not nearly as inclined to munch. If I’m extraordinarily busy, I don’t do it. I firmly believe it’s behavioral, but knowing that doesn’t make it easy to stop. When I’m home on the weekends, I don’t do it. I eat a normal breakfast in the morning and am good until I’m hungry for lunch, about 1 or 2 p.m. I’m not overweight, but I’m a trainer and avid runner, some of that to make up for the overconsumption in the mornings. This has very little to do with the food itself, and much more to do with behavior and surrounding circumstances. I have battled many ‘food’ addictions now I’m glad to say im down to just one, but the main problem without a doubt an ‘eating’ addiction, I think about eating with every waking hour, what am I going to have next? Will it fill me up? Will it ruin the thing I have after? Ridiculous thinking but that’s what happens, i get down that I have to control not only my eating but my thoughts also, I am using techniques to combat these thoughts like drinking water or concentrating on something else, but what is working is a little nibble on a dry chilli to give the taste buds some satisfaction, whilst sadly still feeding the addiction.. For now. Until I can beat this ‘eating’ addiction fully. Thanks to this course Things are looking brighter by the week. This is great stuff and backs up what I’ve been thinking. As an ex smoker I totally appreciated the comparison. Sugar is so addictive I had a terrible sugar addiction, I have now minimised my sugar intake to fresh fruit only all week and only treat myself to some chocolate at the weekend. Linzi, you’re doing great. Keep going, we’ll be cheering you on! Yes I believe eating addiction is a problem in our society I’ve watched my father eat right before going to bed knowing that he couldn’t be hungry. And I thought to myself this is bad & I’am not going to be like that. But I find myself doing the same thing, I want to eat before going to sleep even though I’am not hungry. Help! I found the article and everyone’s comments really interesting and helpful. I gave up smoking 22 years ago and put on 1.5 stone in 6 weeks as I kept putting something in to my mouth instead of a cigarette! I have bad days of feeling really hungry and overeating though fortunately my diet is 80% good so even when I overeat it may be a big bowl of porridge in the evening, a couple of hours after my meal. That said, choccies and wine at the weekend are very nice! It is very easy to get very stressed and feel guilty about overindulging and we all need to be kinder to ourselves and try to calm down, breath deeply, and relax. This is very interesting because I’ve noticed my two year old seems to be ‘addicted’ to petit filous which she often eats four at one time. I noticed she loves to go to the fridge, get one out (or several), take them to the lounge or on the kitchen floor and then she peels the lid off, licks the lid and then eats the pot! What is quite interesting is she can’t quite finish it but starts on another. It’s as if the ritual of eating the petit filous is the bit she likes best. If I put it in a bowl for her she goes wild and will not eat it! I have tried weaning her off them, but it hasn’t worked so I’ve stopped buying them as they are full of sugar anyway. She only seems to like those particular ones though, or a different brand which is also full of sugar and in a similar pot. She had natural yoghurt the other day but screwed her face up and shook her head. Already she is addicted! I’d love to know what you think to this! As long as i can remember (4years old) ive had ‘food fads’. I think it started with sweets my mum would buy me after school. Tootie fruities and wine gums especially, i would line then up in colums and colours and eat the ones i least liked first, moving on to finish with my favourite colour. I then done the same ritual with my food. Its carried on all through my life. I have OCD and bipolar and i think it all stems back tome thriving for perfection. Forgot to mention that i would line my sweets in ‘perfect’ colums and once my dad took a sweet from my ‘perfect’ line and i had a complete meltdown for the whole day. I thought he had ruined my life. It was all very strange but it has carried on until now. I am 43 and still have abnormal food habits. Keep an eye on your daughter with the yogurts and she if she developes other behaviours with food and tidyness of her room, clothes drawer ect. She already tidying things up – for example she straightens the mat in the bathroom if it’s flipped over and she picks up stray food which had fallen off the plate and puts it back. This is my fault I am the same! But I’m not OCD, I’m just bordering on OCD. I do let things go a lot more than I used to, especially since having a child. Thank you for sharing this. I did the same thing as a child. My variety of food sorting didn’t bother me so much if someone ate a color and disrupted my pattern– I would simply eat my way to return to the pattern as soon as possible. But I had (and have) the added compulsion of eating everything that I had sorted. My eating compulsion often has me eating full boxes of cereal, whole cans of pecans, whole roasted chickens, etc. Sometimes I eat all the broken nuts in a container (or half- oyster crackers), and then I eat all the whole pieces. Only by the luck of my metabolism am I relatively healthy (low blood pressure, cholesterol, etc.) However, because I don’t have any overt consequences, I’ve never learned to stop this compulsion for finishing things. This is a very interesting article for me because my Father was an alcoholic. I have heard about something called an addict personality. I feel that I am addicted to sugar & wonder if there is a connexion that I inherited from my Father. Would be interested in information about this. If you try to take away the behavioral pleasure of eating, then eating becomes mechanical. Yes, all the behavoirs described in the article regarding eating addiction can be rewarding and are part of the experience of eating and overeating, but I don’t advocate trying to force someone to stop doing them. Instead incorporate healthy foods so that the pleasure of eating and the behavoirs associated with it can become part of the new lifestyle. Crunch on nuts, not potato chips. If you want to be reaching for something while watching TV, then substitute a healthy snack like kale chips. Another behavioral method to encourage is mindful eating, not mindless eating! The experience of mindful and intentional eating can make the action of eating extremely rewarding, much more so than scarfing down a bowl of crisps or popcorn while your attention is elsewhere. I’ve never seen as many responses to an article as I have to this one. I think that’s an indication that eating/food-associated (mis)behaviors are an enormous problem. Not only that, but people are aware that they’re doing it, they’re just powerless (or at least, feel powerless) to do anything about it. Maybe this isn’t new, it’s just more “out there” since technology enables easy communication. Yes, it’s a good idea to replace unhealthy snacks with healthy ones, but doing that can often just put a bandaid on the underlying problem – WHY are we eating – as someone said – mindlessly? Why do we “need” to eat unless we’re hungry? Why do we USE food as a substitute for – what? General good feelings? About ourselves? If that’s true, then we have even more to resolve than bad eating habits. It’s downright scary. Seems very clear that we need to address both Eating Addiction and Food Addiction. We are developing BitBite – world’s first wearable device that monitors your eating habits and helps you improve them. I think that BitBite may help both addictions as the user gets a real-time picture of his eating habits and tips to overcome his addictions. I feel as though so often actions and hobbies are paired with a habit or behavior things we don’t notice our selves doing. Take for example I live in Boston, it is so hard trying to find something to do without it involving food, like the local famous pasty joint or having to try the local brews. Along with pairing hobbies such as movies with popcorn and candy. Bar’s always have apps and snacks that are not something you should be eating regularly. You think of hockey games and football games, you think of hot chocolate or beer. Having a hot dog at a baseball game or even the pressure of trying to plan something with a friend, everything involves food. It’s almost as though our life evolves around it, and it completely does! I know at my job it’s what keeps the crew happy, I am the moral. If more people were to choose hobbies like rock climbing or hiking they don’t realize but the physical activity is benefitting them as well stopping the Intake of unnecessary calories and allowing your body to tell you when your hungry. Eat to live, don’t live to eat, is what I always say! There is a 12 step recovery group called Overeaters Anonymous. They developed from watching Alcoholics Anonymous using 12 step recovery to deal with addictive behavious. I have been a member for close to 20 years. It looks at both foods which trigger compulsive eating and also the spritual/emotional issues which trigger the same compulsive behavious. I believe the problem is eating addiction. We eat because it gives us pleasure satisfaction warmth security the list is endless. What we do is turn to food out of anxiety stress depression joy to celebrate. Food in my culture (italian) is used as the centre of everything it unites friends and family, brings people together to relax and enjoy some time together in an otherwise hectic life. For me it’s the cooking and seeing others enjoy what I prepare. What is not included or thought about in any of this is control, balance, eating to live rather than living to eat!!! So yes targeting the eating addiction is fundamental. Intriguing article! Studying both food and eating addictions is definitely the way to go. This all brings to mind the day I discovered the term orthorexia nervosa – a “proposed” eating disorder or mental disorder characterized by an extreme or excessive preoccupation with avoiding foods perceived to be unhealthy. (Wikipedia) Let me tell you that this “health food freak”(just another lovely term of endearment) was highly offended to learn of a new disorder that seemed to fit the bill in my life. Disorder was never felt. Confusion, as I tried to keep sugar out of my childrens lives, was felt. Some have called me an abusive mother, because I tried to restrict their intake of processed and unhealthy foods. I’ve been a sugar addict all my life; I think it might have had something to do with all those brown sugar sandwiches on white bread with home tinted margarine that I could talk my loving Gramma into making for me! (Oooo>>addictive personality sets in at an early age!) Eventually, I got over it, especially since my now adult sons have not one cavity between them! I’ll be curious to discover unfolding results as to how eating addiction and this proposed orthorexic disorder stack up together. Thanks for keeping us up to date, I’m enjoying the scientific research articles and current subject matter in the course materials. Thanks for sharing your story! As a woman who is planning on having children in the future, it is inspiring to hear from parents who are very conscious about what types of food they bring into the home . I was given soda and sweets as a child and didn’t break the habit until college when I moved out of my parent’s home. It seems that children who are fed healthy food continue to eat healthy as adults. Cheers! Don’t want to prolong this discussion past it’s ‘use by’ date but I would like to hear if anybody knows of a study which has been done to look at the reasons why people eat and why they eat what they eat. Is it nature or nurture? As a UK citizen, I know that I am not alone in having a need to eat everything on my plate engrained in my psyche by my mother who lived through the period of WW2 when food could be scarce. People in the USA do not seem to have this issue. Don’t know about the States but my generation in Canada certainly clean our plates… I compensate by deliberately saving what’s left on my plate for lunch the next day, therefore not wasting food and deciding before I even start that this is also tomorrow’s lunch, so don’t eat it all. Colin, I was raised in the u.S., am probably about your age, judging from the WWII reference, and I, too, was brought up with the eat-everything-on-your-plate mentality. I raised my kids that way, too, but no longer abide by that, nor do they. I’m also interested in the answer to your question about what people eat and why. I still love sugar, eat when I’m not hungry, although I also eat healthy foods. I’m not overweight any longer, but I would be if I didn’t work out daily, both for the strength as well as to keep my weight in check. It’s encouraging to me to see all the responses to and participation in this subject. It means that at least an awareness of this world-wide problem is growing. I am from the US. I really enjoyed reading this article and everyone’s comments. I have been overweight most of my life. I associate food with everything. I never realized that my addiction to food is not just the “food”, but the satisfaction of the act of eating the food! I eat, not because I am hungry, but because I think I am depriving myself if I don’t. I never ever eat when I am hungry. I don’t even know what that feels like. I eat because everyone else is eating. I know the difference between good food and bad food. I over eat the good food. I always read labels. I am also gluten intolerant. My problem is that I eat everything that has “gluten free” on the box. I just realized that just because it has “gluten free” on the package, it doesn’t mean its healthy for you!Thank you so much for this article. It has helped me so much! Food Addiction is an Eating Addiction with a root cause, see further below. Generally speaking the food industry is not there primarily to look after your health from eating, but to output food as a “Revenue Stream”. Generally food is “Designed” to be wanted (potentially leading to an addiction), with its combination of fats, sugars, additives, preservatives, colours, etc. “Comfort Eating” can be an indirect “Eating Addiction”, as a result of some factors including Designed foods in combination with not being/looking healthy/slim, in the vicious circle it creates. Eating disorder is the top level description, Eating Addiction/craving/avoidance/etc. are the different disorders, as a result of many things, e.g. stress, incorrect foods, ease of access, convenience, non-awareness, etc. They should be recognised and treated for their root cause(s). I feel it for the children being given or having access to non-foods (as opposed to actual foods packed full of nutrients, these non-foods are sugary drinks, sweeties, crisps, biscuits, etc. ), as non-foods compromise the children’s development and short/long-term health, genetic expression, behaviours, etc. leading to their reliance on them. But everybody (for the children’s and adults sake), should push-back against the food industry and avoid the processed and non-foods, helping their health and well being and the Health Sector costs. Not eating the right things compromises our immune system and our ability to fight off illness; that’s where drugs come in, and that is another story and Revenue Stream, that can compromise you. Summed up (but using the term food, to mean real food), from +2,000 years ago: Hippocrates is quoted with “Let food be your medicine, and medicine be your food” = let real-food look after your health, by looking after your real-food/intake. My big problem is, that I have 3 children, and they eat all the time…we eat healthy, but still, every time they eat, I feel obliged to eat with them….every time I feel sorry after this. The tongue is the easiest sense organ to satisfy and reaching out for something to eat has become an easily available recreation. If we are well occupied during the day and more organised with our actions, our mind and hands will not think or reach out for something to chew.Stress eating can be replaced by simple exercises which are far more beneficial than stuffing our faces with food.Even a good refreshing bath can do the trick if not an elaborate and costly massage at a spa. Catching up with friends need not lead to eating together always…that should be secondary. A sweet light hearted chat or a well grounded and balanced discussion about a topic of common interest can also make you feel so good.Just change your ways to see a much more happy you. Hello, thenk you for your advice, but I think the problem of mothers with children is exatly preocupation, and not the lack of something to do…my problem is that I have to make food 5-6 times a day(we eat healthy, but live in a country, where this is a very expensive thing….and I must prepare all our food alone so that we can byi a healthy food…I mean for example, we dont eat serieals, exept very reare…Im baking our bread from eincorn flour, and Im preparing everything we eat)… I have two boys 10 and 8, and a baby….they are with me all the time, because I’m a homeschooling mom. Even if I dont make their food, when they eat, I’m in the same room, because the baby will whant to eat allso…sometimes I’m going out in the yard wile they are snacking…but I can’t do it allways, because it is taking more time to set our day after this… I have no time for going out with friends exept for once a month, or even in 2-3 months. When I see a friend it is usualy for cup of cofee…. Thanks for taking time to read my response Hajar.I was aiming at those who stress eat and as recreation. Yours is a different situation. True when you cook so much and feed kids often we do tend to eat too. Glad you are cooking healthy…keep it up.As you would have read else where too many times, it is a habit we need to shed.You need to schedule your eating timings too according to your needs so you could stay healthy to take care of the kids and family.It is like wearing the oxygen mask in a flight first during an emergency before we make the child wear it.Meeting friends for coffee once in a while is perfectly ok. This is such a complex issue! I turned to food when I was a child as a result of sexual abuse and it has plagued me ever since. An earlier poster said “feeding the hungry heart” and I feel this is not just a metaphor but actually true in this case. Good article, looking forward to reading more. It was interesting to learn that Eating Addiction is being researched in addition to Food Addiction. I have always tried to maintain a diet that takes into consideration the social norms of eating eg while watching a movie, when meeting with friends, and lunching at work. I guess it is something I need to think about more in my usual eating habits if I am to ensure I follow a healthy diet. I think I eat all the time to procrastinate I have things to do but I don’t want to do them so I eat instead of doing the work I need to do. I also eat when Im on an emotional high or low. I don’t need a particular kind of food just to mindlessly be munching and eating. I believe Im addicted to the act of eating. Donna, good you are aware of what you are doing. Half the battle won.Good news is you eat anything and not very particular or choosy. 1.Just stock up with healthy options so you get healthy while you procrastinate. 2. To get you to not procrastinate just take a minute to think about what would happen if you do the work versus not doing it. 3. Emotions are connected to what you do or dont….when you dont do a thing….frustration makes you grab a bite. 4.Addictions are what we get into ….they do not get you. Yes, this battle with the food industry, as people think generally, that they are selling good nutrition food, when they are in business to make money; some are good but most are not-good (watching my words here). Best approach is education, or some way of letting them see that proper nutrition is a medium-long term investment in health/well-being/immune-system, and to stay that way takes effort and avoidance, and when they have their kids they will say same. I had a major ahah moment this morning. Driving to work, getting ready to eat my dry waffles (instead of toast with butter), I realized that what I really enjoy is not necessarily the food, although if something tastes great and has an awesome texture, I do love that. My true enjoyment is actually putting the food in my mouth. That actual moment of putting my hand or fork to my mouth and taking a bite. That feels/seems so strange to be something I actually enjoy almost as much as life itself. I’m a little freaked out about it, but knowing that it’s a behavior/like thing, I can address it. Okay, I can address it…..still.feels.weird…. I am sure it’s a mental problem because I stopped smoking (as opposed to giving up smoking)when I realised smoking had got me in its power and I couldn’t give it up. Fortunatly, I turned it round in my head and suddenly hated smoking and I’ve had no problem since: 40 years ago. Definitely, research is needed into these addictions. Alex, you are on the right road. Push ahead.. I don’t think I have ever been so pleased to read an article and comments in my life. This has confirmed what I suspected years ago – I think I am an eating addict. What to eat, and when can I next eat, has ruled my life for as long as I can remember, although I am much better generally than I used to be. If I am busy now, ironically enough like when I am cooking, I am not bothered. But when I am working / studying I always want to eat. It doesn’t seem to matter what, as long as I am eating. I used to be a sugar addict, but not any more, I eat healthy foods mainly, but I get so cross at myself for not being able to stop when I am full. I overeat a little bit every day, why? I am not overweight because they are healthy foods and because I exercise. But I wish I could stop. The comfort I have taken from reading all your comments, and this article, will stay with me for a long time. I am not alone. Thanks so much for this fascinating article! I never thought of my food addiction as an actual eating addiction! You gave me much to think about! Yes it is the act of anticipation of receiving the food NOT the actual ingesting of the food itself! I can only speak for myself!How obvious is this!!!! LOL! Thanks for the fresh perspective on an ancient addiction!Blessings!